Allison Hamilton, RN, case manager in acute nursing, was named Greene County Medical Center’s tenth DAISY Award honoree at a ceremony on Wednesday, November 14. There were thirteen nurses recognized at the event, representing every area of the medical center. Other nominees recognized at the November 14th event were Long Term Care nurses Stacey Biggart and Deb Schoon; surgical nurse Heather Shipley; acute nurses Andrea Allbee, Karen Carman, Cassie Fowler, Kelsey Savits, Gina Geisler, Terry Rottinghaus; clinics nurses Tammy Kiner and Deb Wolterman; and care management nurse Laura Walker. All nominations were filled with gratitude for the care these nurses provided in compassionate and professional ways. Greene County Medical Center has recognized nurses through the internationally-known DAISY Award since 2014 and holds ceremonies twice a year. Nominations for the DAISY Award can be made throughout the year. Nomination forms and submission boxes are located throughout the medical center or electronically via the medical center’s website, gcmchealth.com. Nominations can be made by patients, their family members, caretakers, community members and co-workers. Fall 2018 DAISY Award honoree Allison Hamilton, RN, case manager, and patient family member, Karen Pope at Greene County Medical Center. 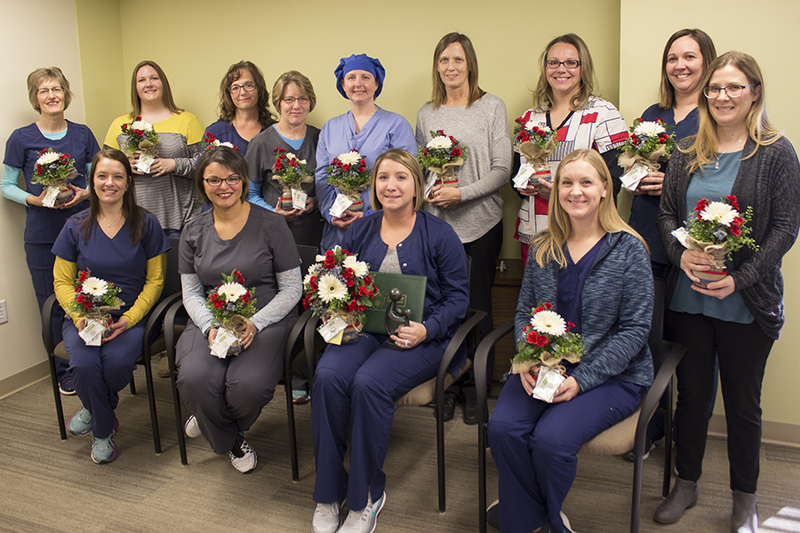 Greene County Medical Center’s fall 2018 DAISY Award nominees. Seated L to R, Kelsey Savits, Deb Wolterman, Allison Hamilton, and Laura Walker. Standing L to R, Karen Carman, Andrea Allbee, Terry Rottinghaus, Tammy Kiner, Heather Shipley, Deb Schoon, Stacey Biggart, Cassie Fowler and Gina Geisler.